When your amazing idea results in unexpected outrage, do two things. Observe the Japanese proverb, When something goes wrong fix the process, not the blame. Then, discover the narrative. 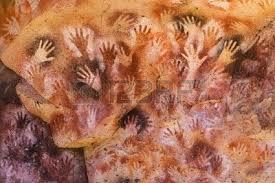 With 40,000 years under our belts, we Homosapiens have become excellent storytellers. 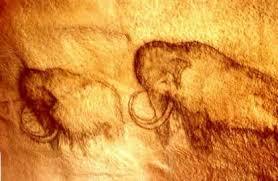 From cave paintings to 3D movies the journey has been impressive. Leverage this strength to discover the root cause of failure. It leads to a powerful understanding of what went wrong. This in turn, exposes recovery plans that work. For this reason I like the A3 Root Cause Analysis. The first thing this analysis requires is to describe the problem. Describing the problem in the form of a narrative, opens the mind, providing a clear overview from several perspectives. At times, I encourage participants to begin their description of the problem using, Once upon a time… This will produce more than enough information to understand the background and current condition of the failed process. After the stories are told highlight commonalities from each version in bulleted lists describing the background and current condition. Then quantify the impact of the problem by creating a numerical picture. Expressing the impact numerically offers a baseline against which improvements can be measured. Example: This event caused a 24% increase in service desk calls over a period of two days. 30% decrease in support calls. 40% decrease in bugs found in production. After background and current conditions are understood and goals are set, we are ready to ask why. Discovering why, is done by asking why five times. This method is so popular it requires no explanation. However we must be perfectly clear, yielding to the temptation to ask why before understanding what happened and the expected improvement goals may lead to addressing the wrong problem. The goals you set earlier, help develop countermeasures (experiments) which are easily decomposed into Epics. These are in turn broken into stories and placed into the team’s backlog. The impact of the countermeasures will be evident as soon as the first stories are completed and presented to the customer. This impact must be confirmed by measuring the results against your goals and baseline. If a countermeasure fails, try another. Follow the Lean Startup mantra, fail early, fail often. Small incremental improvements are much more impressive than a partially implemented all encompassing plan. Developing a policy to keep an event from ever happening again does not work. The only purpose of this effort is to threaten people, not improve quality. The A3 Analysis does not let us off lightly. Putting successful countermeasures in place and eliminating those which fail is only the beginning. We are expected define follow-up steps and continuously keep our eyes on the countermeasures looking for additional experiments. The A3 process is brilliant. Not only does a team shore up their weaknesses through discovering effective countermeasures, but works to improve the improvements! 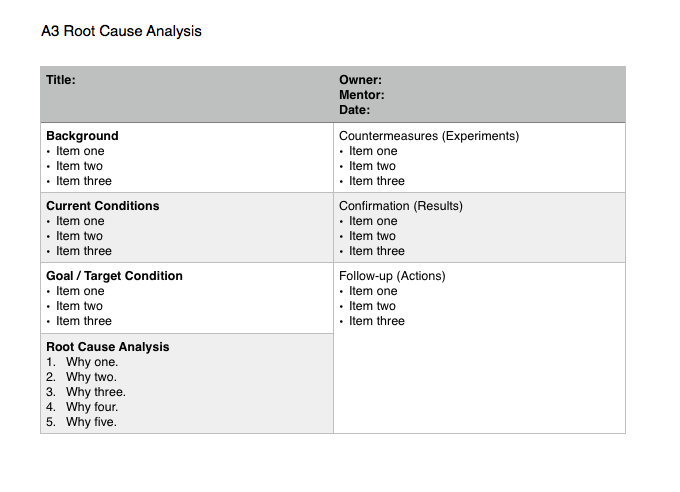 Here is an example of a basic A3 Root Cause template. Try it out. I’m confident doing so will enable mistakes to evolve into long term sustainable change. This entry was posted in Product Owner Stuff, Recent Posts, Scrum Master Stuff and tagged A3 Root Cause Analysis, Agile Scrum, Kaizen, Larry Lawhead, Lean. Bookmark the permalink.